This article discusses the psychology of gamblers and explains what a staking plan is, why such a plan is of enormous importance, and the mistakes one should avoid at all costs. With any form of betting it is essential to calculate individual stakes correctly and to adhere strictly to a staking plan. This philosophy is borne out by the following negative example of how a good underlying picking system was undermined on a long-term basis by a poor staking strategy. As you can see, during the first two thirds of the history (up to bet 26), 75% of the bets won and as the bank increased (from bet 20), so did greed and indiscipline with stakes rising and no adherence to the original staking plan, if there was one at all. A ‘must win’ bet was placed to recover losses (bet 21), which promptly lost and reduced the bank by 60%. A lot of hard work down the drain. This was naturally a shock inviting more caution and subsequent wagers were placed with smaller stakes (bets 22 to 26), which again proved to be good picks and won. However, with smaller stakes and wins the bank was now not growing fast enough to reach its original peak easily. This was naturally a disappointment, especially after weeks of effort. Both mind and heart badly wanted to win but the next decision to increase the stakes once more put huge pressure on the whole system. 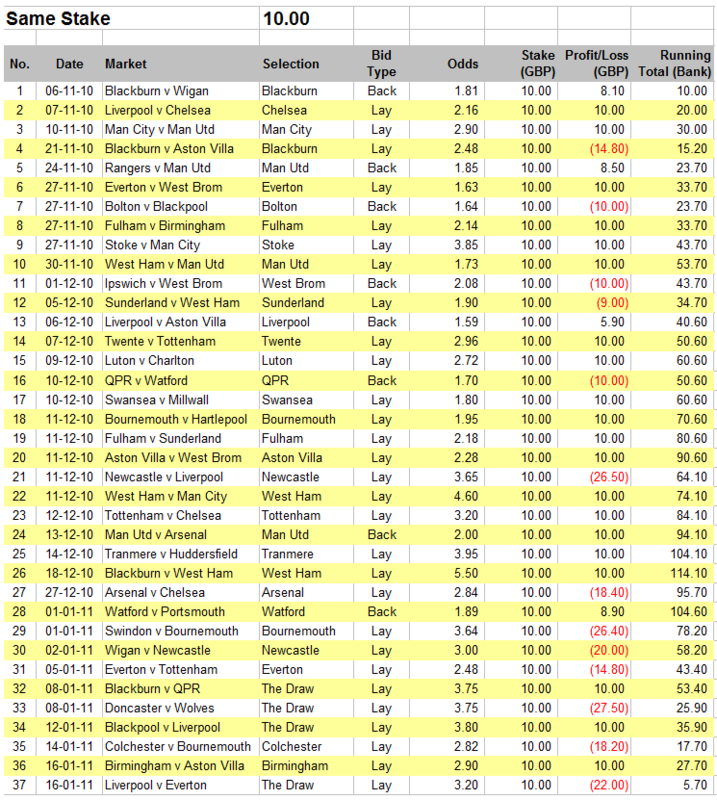 Hence, the picks were perhaps no longer chosen as carefully as before and over 70% of the next eight bets lost. Instead of growing the bank as hoped, a negative bank balance began to accrue. Finally, another ‘must win’ bet (No. 35) was identified and staked with the primary aim of retrieving or ‘chasing’ the losses, and this was the straw which broke the camel’s back. Naturally, “Sod’s Law” came into effect when Colchester United came from behind to beat an in-form AFC Bournemouth side with two goals in the last 13 minutes. Done your money. I have been observing this boom-bust pattern for a while now: Does it sound familiar to anybody else? The secret to successful betting (in terms of actually making money and not just the percentage of successful picks) is not to stake the whole house on a ‘must win’ bet. Statistics are the key, combined with patience and the utmost discipline. The above table shows a staking plan which risks the same amount of money for each back or lay bet (GBP 10), and despite the above average number of losses towards the end of the time scale the final profit would have been GBP 44.67. Bet 1: A back bet was placed on Blackburn to win at odds of 1.81. Blackburn won, and the profit was GBP 8.10. Bet 4: A lay bet on Blackburn (i.e. Blackburn not to win). The odds were 2.48, and the stake therefore GBP 6.76. The lay bet lost and hence the loss was capped at GBP 10. Had the bet won the profit would have been GBP 6.76. Up to bet 26 this staking plan would have made a higher profit (GBP 114.10 instead of GBP 93.30), but it is more vulnerable to a chain of losses. In this example, it wins only GBP 5.70. As you saw in the first table, the complete lack of a staking plan made a loss of GBP 155.38. My suggestion for long-term profits is to employ a stepped staking plan with the same commitments for each bet. For example, starting with a bank of GBP 50 and placing bets with commitments of GBP 5 each. As soon as the bank rises to GBP 100, then the commitment can be increased to GBP 10 for each bet, and when the bank arrives at GBP 150, continue with GBP 15 per bet, and so on. Obviously, this style of staking plan will only work if my husband can continue with his 75% picking success! Experiments using new strategies in the same betting bank should be avoided, as should ‘chasing’ losses with higher stakes and liabilities. I think I have not made myself clear entirely. The staking plan I mentioned above does not consider neither a fix profit nor a fix risk but a fix returning (stake + winnings = constant). I think, statistically, it’s called fixed sum but I’m not sure. You divide this amount each and every time by the odds so that your profits and your stakes will fluctuate always depending on the odds but the returning on each individual bet (the sum of the two, stake and profit) will be always the same, the fixed amount you considered in the first place. I want to discuss with you another staking plan: a fix amount divided by the odds. On this particular betting sequence presented by you it yields less than the standard staking plan (uniform liability) due to the large variation of the odds selected but I think it performs slightly better in general. Anyways, I would like to hear your opinion on it. the staking plan you are looking at is which we call: Fixed win/risk staking plan (=equal win, equal risk). You always win the same amount when backing, and risk the same amount when laying. I have different staking plan. I multiply propabilities (in my opinion) and odd and it must be over 1 (usually from 1 to 1,2). When i bet lay i just simple reverse odds like it would be back bet. I think it’s very popular and common staking method. What do you think about it? The big question is how do you come up with your probabilities? Otherwise this approach is valid for identifying value. Thanks for you comment but I’m slightly confused as I don’t see the relevance for staking?